Cover Description: Booster Gold flies towards the reader with Michelle Carter, Skeets, and Rip Hunter in the background. 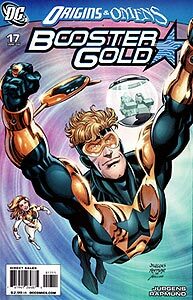 Brief Synopsis: Booster Gold struggles to ensure that historical events occur as recorded. Issue Notes: The backup feature in this issue ties into the "Origins & Omens" event running throughout the DC Universe in issues released in February 2009. For the second time, Booster Gold encounters Kid Flash, the sidekick to the second Flash who would one day serve alongside Booster in the Justice League International. Once a common sight in the pages of comic books, a rare editor's note makes it's appearance at the bottom of this panel, notifying the reader that referenced events took place in issue 4 of this series. Sure enough, Booster is watching a scene between Flash II, Kid Flash, Rex Hunter, Rip Hunter, Skeets II, and Supernova III exactly as delivered in the noted issue (pages 4 and 5, to be exact). A PAIR OF DOCS? : In fact, this panel appears almost exactly as the second panel on page 5 of Booster Gold, Vol. 2, #4. Booster notes that this is the day that Barry Allen will be struck by the lightning bolt that will bestow upon him the power of super speed. If you've been paying attention, you may have already guessed that this is exactly why Booster and the gang were here at this exact place and time in the aforementioned (several times) Booster Gold, Vol. 2, #4. Booster comes face-to-face with Chronos, who is planning on stealing clocks from a Central City museum. Booster calls Chronos a lightweight, despite a recent adventure where Booster was nearly bested by Chronos and his future gal pal, Lady Chronos. Booster Gold finally meets Barry Allen, the second Flash, before he gained super speed. To no great surprise, Allen holds a gun on Booster in what is sure to be the first of many hero vs. hero confrontation in Allen's storied career. Boosterrific Review: Geoff Johns' Booster Gold, Vol. 2, #4 was such an enjoyable read that with this issue Dan Jurgens returns to that issue. Using previous events as a backdrop, Jurgens tells the tale of what really happened behind the scenes to restore the proper history of the second Flash following the intervention of Rex Hunter. While it is best not to think too hard about how the events of this issue relate to those of the previous issue (mainly because there are no answers to the many, many questions that this issue raises), this issue is an action/adventure story in the best Hollywood popcorn-movie convention. Like any action-oriented Hollywood super hero movie, the issue also includes an extended origin story for our hero to catch an unfamiliar audience up to speed. Straightforward and to-the-point, the origin story may be the best part of the issue as it sums up Booster’s complex history while teasing his near future.